You’ve done everything you can to be successful in college, but things don’t seem to be adding up. Not only has your productivity gone out the window, but you’re struggling to figure out how to make good grades while balancing everything else going on in your life. You know it’s time to make some changes, and you’re ready to make this happen! By the time you’re done with this workbook, you’ll know more about yourself as a student then you probably ever thought you could! What makes this workbook different from others? 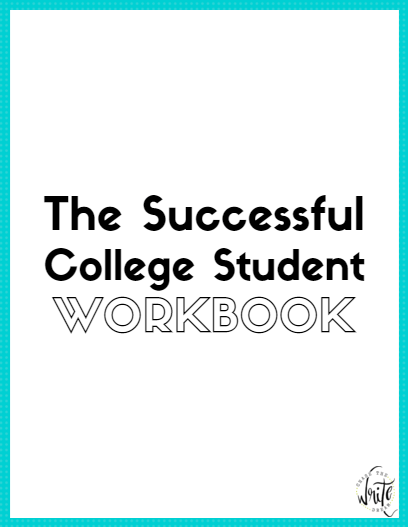 This workbook takes into account that every college student learns and operates differently. By asking the right questions and including interactive worksheets, students will leave with a better understanding of themselves, as well as different tools and strategies for making improvements. Tori, the mastermind behind Chase the Write Dream, put this workbook together. She has a bachelor’s degree in human services, a master’s degree in psychology, and has worked in the education field. All of these strategies have helped her and her students achieve academic success throughout the years. After I purchase the workbook, when will I receive it? Please note that this workbook is electronic only, meaning you won’t get a printed version in the mail. Instead, you will be able to download the workbook as soon as your purchase has been verified (which should take no more than a couple minutes).